and i worked on this project a few years ago and lately it seemed to have died a quiet death. But it seems that it is back to life!!!! HPS is resuming work on the 5.4L intake!!! Re: HPS 5.4L SOHC Intake may to the market after-all!! This bad boy was designed to fit under a 94-97 MN12 Thunderbird/ Cougar hood! Has anyone install one yet? Looks good only if they came out with it a few years ago they would of made a million with it. Not in a thunderbird mostly do to chest beating an the like from JL, KD et al. I know that one was just installed in a Mustang. No report on gains though. They say you need long tube headers. So with a T-Bird will need a hood & k-member and a hammer for long tubes. So the Mustang boys-n-girls will take the lead. I am too tired after the Big Phillies win. Maybe I will crunch it out the other day. It will be interesting to see the dyno numbers on one of these? Even more so after someone gets a set of cams specifically designed to take advantage of the long stroke of the 5.4L engine. so how do you think this intake will stack up to your intake ? This intake has everything I wanted to do to my intake and could not do. A few years ago and I were talking to Bob at HPS about what we wanted to see in a 5.4L SOHC intake. We went back and forth for several months. I even sent him a Ford 5.4L van intake I had sitting in my garage. The intake was dissected like a lab rat for the better good of mankind. Before I get into the details lets look at my current dyno. 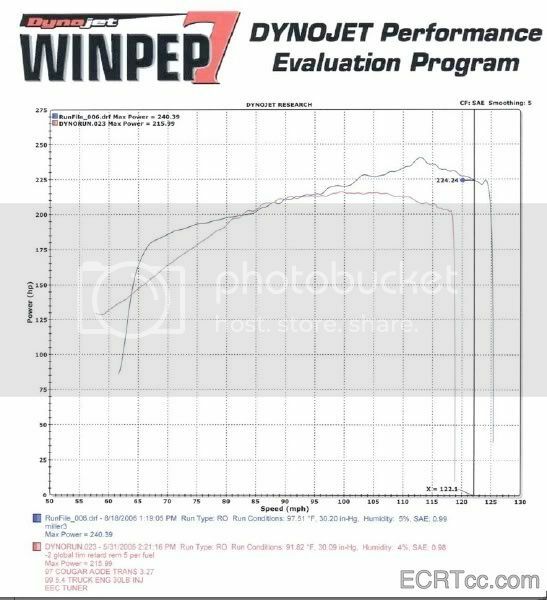 The red curve is the 4.6L intake that had one side lengthened in a stock 98 5.4L engine with stock 4.6L PI heads/ cams and stock thunderbird exhaust down tubes that were extrude honed but not ported. This The blue curve is the home made Bullet intake with long runners and weld slag inside the runners on a stock 98 5.4L engine with stock 4.6L PI heads/ cams and stock thunderbird exhaust down tubes that were extrude honed but not ported. 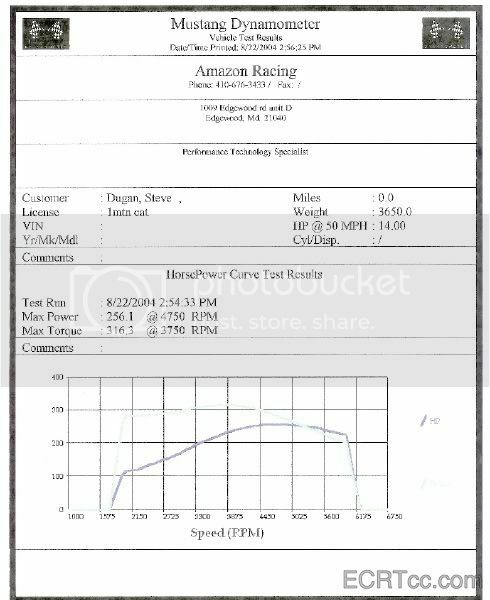 I see the HPS intake similar to the blue line but rounded up a little more in the middle and peaking at a higher RPM level. Possibly somewhere around 250 HP with stock PI heads. More with better flowing heads, long tube headers and cams designed for the 5.4L engine. Below is a dyno form Steve's 4.6L engine. 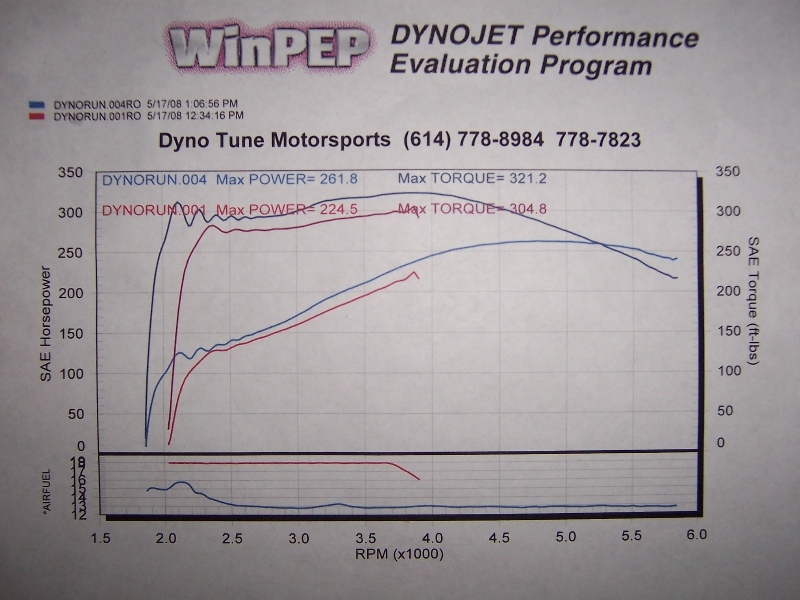 If you compare that curve with my dyno you see that I have more bottom end HP and have losses at higher RPM. This is because my intake is not providing an even flow at higher RPM levels. With the new 5.4L intake you will have shorter runners. Shorter runners will sacrifice torque for HP so you can have even more HP at the low end. So if the same driver was in both cars and they started at the same time I would assume that he 5.4L will get a jump on the 4,.6L and will only have to worry about the 4.6L at the end of the race. Of course in a real race experience will dominate and Steve will win. We expect actual dynos from the Mustang boys in the next few weeks. Interesting to see if my hypothesis is close? The HPS intake out of the box has 10" long runners. I believe 9-10.5 inch runners are the best for the 5.4L. You'll have to have some spacers made for the k-member to drop it at least a 1/2" to fit long tube headers. That is not problem for any k-member manufacturer. I found one dyno that has mods close to Steve. Custom tune by Brian at Dynotune Motorsports. The first run looks like it had a stock dumptruck intake. He can shorten those runners and sacrifice bottom end torque for HP? looks impressive.... is the cougar gonna get a new addition soon!!??!?!?! Bla the Cougar gets one final tune, a fast run down the track but she has a buyer waiting on the shadows. That project is almost done now it it time for the SC and this time I am going to design her for speed not longevity! a buyer!?!??! don't tell me your selling the cougar! i love that car!